Join one of television’s most irreverent families, the Gallaghers, when Warner Bros. Home Entertainment (WBHE) releases another season of the hit Showtime series "Shameless" on DVD April 24. "Shameless: The Complete Eighth Season" brings our favorite clan together for another scandalous season featuring 12 highly entertaining episodes, plus bonus content, including two new featurettes and deleted scenes. From Emmy®-winning executive producer John Wells (ER, The West Wing) and Warner Bros. Television, "Shameless" stars Oscar®-nominated actor William H. Macy (Fargo, Door to Door) as Frank Gallagher, the outspoken, alcoholic, single father of six industrious and independent kids from Chicago’s South Side. "Shameless: The Complete Eighth Season" will retail for $29.98 SRP. In addition, "Shameless: The Complete Eighth Season" is available on Blu-rayTM courtesy of Warner Archive Collection. The Blu-rayTM release includes all bonus features on the DVD, and is also arriving April 24. Warner Archive Blu-ray releases are found at wb.com/warnerarchive and your favorite online retailer. "Shameless: The Complete Eighth Season" will be available to own February 28 on Digital via purchase from digital retailers. The Gallaghers are finally on an upswing in season eight. Frank (William H. Macy, three-time Screen Actors Guild Award® winner for his role on Shameless), tries to become a contributing member of society. Fiona (Emmy Rossum) finds success as a landlord. Lip (Jeremy Allen White) struggles to stay sober while Ian (Cameron Monaghan) takes up a cause. Debbie (Emma Kenney) tries life as a single working mom, while Carl (Ethan Cutkosky) gets creative finding tuition money after losing his military school scholarship. Meanwhile, Kev (Steve Howey) and V (Shanola Hampton) wrestle with Svetlana (Isidora Goreshter) at The Alibi. Based on the long-running, award-winning British series, "Shameless" was developed for American television by John Wells and created by Paul Abbott (State of Play) and made its U.S. debut on Showtime January 9, 2011. Season eight premiered to over 3 million total viewers. 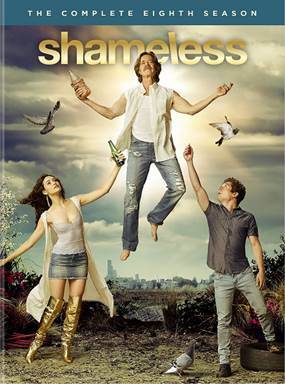 The eighth season of Shameless was executive produced by John Wells, Nancy M. Pimental and Sheila Callaghan. Produced by Bonanza Productions Inc. in association with John Wells Productions and Warner Bros. Television, the series stars William H. Macy, Emmy Rossum (The Day After Tomorrow, Phantom of the Opera), Jeremy Allen White (Movie 43, Afterschool), Ethan Cutkosky (Fred Claus), Shanola Hampton (You Again), Steve Howey (Reba), Emma Kenney (The New Girl in Town), Cameron Monaghan (The Giver, Gotham) and Isidora Goreshter (2 Broke Girls, A Leading Man). My Shameless Sister (Featurette) -- Emma Kenney (Debbie Gallagher) takes center stage as host of this funny and insightful interview with her very own Shamelesssister, Emmy Rossum. My Shameless Mentors (Featurette) -- The talented women of Shameless sit down for a "no holds barred" conversation with host Emma Kenney. Her interviewees include Costume Designer Lyn Paolo, Writer/Producer Nancy Pimental, and actresses Isidora Goreshter and Shanola Hampton. The eighth season of Shameless will be available to own on Digital beginning February 28. Digital ownership allows consumers to instantly stream and download all episodes to watch anywhere and anytime on their favorite devices. Digital retailers include Amazon Video, iTunes, Google Play, Vudu, Xbox and others. Warner Archive Collection (WAC) continues to serve as host to some of the most belovedfilms, television series and animated entertainment in history – and many are now available on Blu-ray. WAC’s canon runs the gamut from restored and remastered Blu-ray classics such as The Americanization of Emily, The Big Sleep, The Great Race, She Wore a Yellow Ribbon, Victor/Victoria and Yankee Doodle Dandy to adored TV offerings such as Longmire (on Blu-ray), Alice and Family Matters (on DVD) to feature-length animated films, including the recent Blu-ray release of Batman: Mask of the Phantasm, to animated TV series headed by recent Blu-ray releases such as Justice League Unlimited, Teen Titans, Batman: The Brave and the Bold and Young Justice, as well as a wealth of classic animated series on DVD including dozens of Hanna-Barbera classics. WAC offerings can be found via wb.com/warnerarchive and your favorite online retailer.